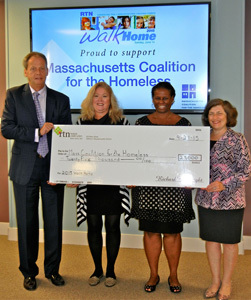 On September 21, RTN Federal Credit Union presented a check for $25,000 to the Massachusetts Coalition for the Homeless, proceeds from the Credit Union’s 2015 Walk Home. Pictured left to right are RTN Treasurer and Chief Executive Officer, Richard E. Wright; Massachusetts Coalition for the Homeless Executive Director Robyn Frost; RTN Senior Vice President of Retail Services Nicole James; and RTN Assistant Vice President for Business Development Sarita Ledani. More than 120 walkers and volunteers participated in Walk Home 2015, held on June 14, in three communities with RTN branches: Dorchester, Waltham, and Danvers. “We are honored to partner with the Coalition and proudly contribute to its important work on behalf of the homeless,” said Nicole James, RTN Senior Vice President of Retail Services. Walk Home 2016 will take place on Sunday, June 12, 2016.